Tekkaforce is a tabletop game of mecha warfare. Build your units with building bricks or with everything you have, then dive into an anime world with your full armed tekka! 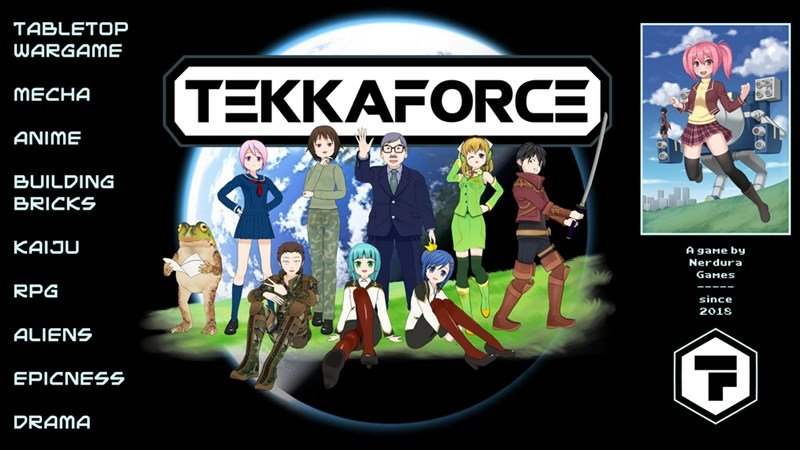 If you love Gundam, Macross, Evangelion, Daitarn III, Go Nagai, mechs, anime, and tabletop games... you are going to love Tekkaforce. Roleplaying rules are included, for your campaings full of drama! Basic rules allow you to assemble a team of tekka made of 1 to 5 units. Each tekka should have different strenghts and a specific tactical purpose, and your team should be designed with diverse equipment, suitable for the next challenge. You'll deploy your team to play a scenario (premade or created by you). You will fight against other players (PvP scenario) or against the game (PvE scenario). If there's no avaiable friend to control PvE enemies, you will solo play, controlling them through a behavior routine. You can also play a PvE scenario cooperatively, tagging along with one or more friends. Advanced rules allow you to create your team's pilots, and they will improve with experience: use their skills to turn the tides of battle! And if you crave for more... you can turn the game into a RPG campaign! The campaign is up and running now. It's set to go for another 12 days.